It’s September and it’s still summer by all accounts in Florida. 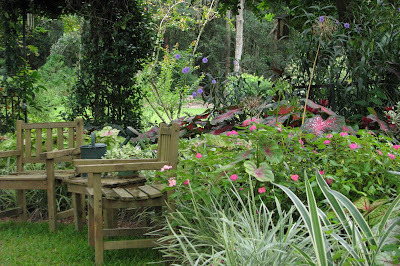 Nevertheless, caladiums continue to provide much of the flare in the garden. And thank goodness for them. They are transitioning this garden into autumn with their delightful array of color variations, shapes, and sizes. 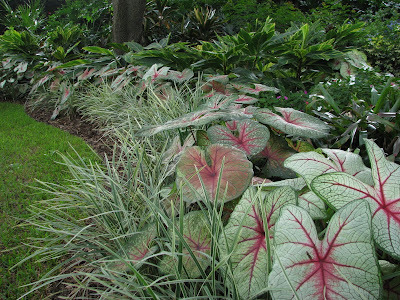 Years ago I started out planting a few caladium bulbs in a nice neat row across the front planting bed. It was so much fun to see them pop up successfully adding a burst of lasting energy in the midst of our hot summer season. That factor alone was all it took for me to fall head over heels for them. My desktop calendar is marked to signal me electronically each February that it’s time to think about caladium orders. 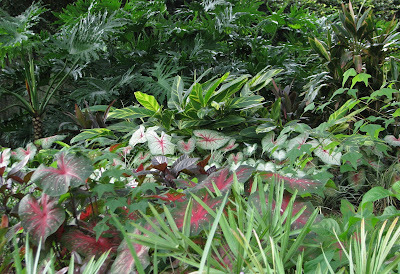 My initial caladium choices are made and placed online by the end of February. The selections and varieties begin to decrease rapidly after that. If you wait too long to place an order there are some favorite varieties that might not be available after that. Even though I place my order in February I request shipment sometimes as late as June 15. The online store will hold them for me until then. I do this so all the caladiums that were left in the ground the autumn before will have a chance to pop back out of the ground by May. Most of them will come back from year to year. Due to my habit of digging, sometimes it is me that destroys a few bulbs throughout the dormant season. I’m sure some of them rot or just don’t return. In any case, each year I fill in the drifts as needed when that June shipment arrives. Often times I place subsequent orders as I’m designing my spring and summer beds. This year I ordered as late as July and planted them late July in the newly renovated front garden. 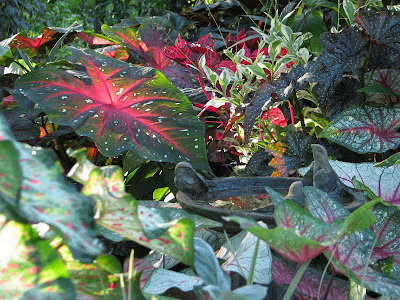 Caladiums thrive in well-amended soil that drains well. They do well in container plants ,too. Once the soil heats up and stays warm day and night they will burst out of the ground in no time. It’s okay to plant them as early as March or April in Z9 or 10 but there will be a longer wait to see their pretty foliage. Over the years I’ve learned to stagger my planting schedule. This works well to supply a show of the fancy heart-shaped leaves right into autumn. Some of the leaves that popped out in March are fading now. But the bulbs I planted in June and July are staying perky even in the late summer garden. I do love these happy foliage plants. For the price and the effort it takes to get them in the ground they yield a fabulous return. Then again I'm a big fan of foliage over flowers. Since those first caladiums that were placed to stand in a straight line like soldiers, I doubt there is a linear edge to be found in my garden now days. As the beds have been hewn out of the lawn they’ve been created to curve in and out for a softer, gentler view. 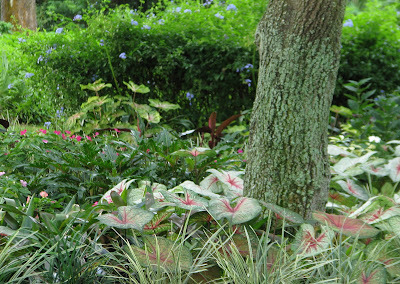 Caladiums follow those bends and dips often in billowing layers accentuating my fascination for texture and colored foliage. As far as placement… I plant them about 2 inches deep into the soil and very close together. I squeeze them between foundation plants so tightly they all help to hold each other up. 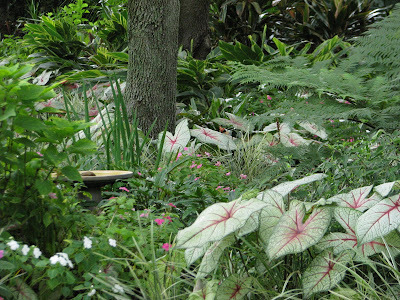 My garden is mostly shady so in almost every planting bed the caladiums receive a good dose of filtered light throughout the day. There are patches, however, that receive as much as 4 hours of direct sun. 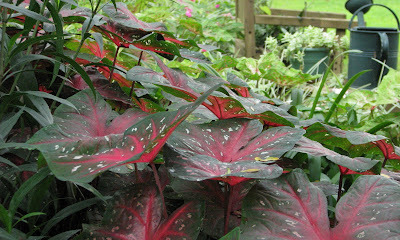 Caladiums are tough plants not requiring any special attention other than watering at least once a week. 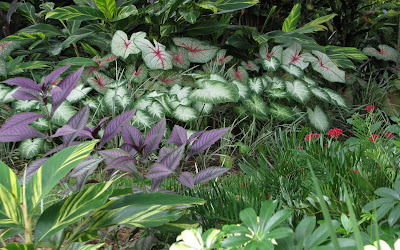 All the caladium websites offer detailed information on which varieties will tolerate sun and which ones are better grown in the shade. I definitely have my favorites. And as you purchase for desired color be sure to take note of the height they will be when mature. Knowing all the facts will help you decide where to site them for their best show. 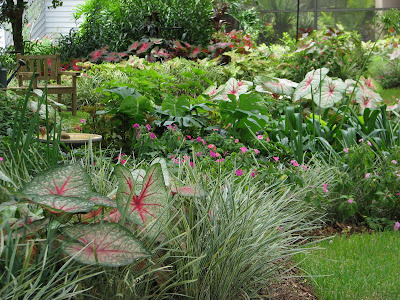 There are so many varieties and sizes that every garden can surely find a place for at least a few caladiums. But I recommend never planting less than 25 in one spot. Go ahead and make a statement with one color or one variety. Your garden will love you for it for many months to come. Meems your caladiums are breathtaking. I don't think they would grow as well here as they do for you however I will try them again if I can get my hands on some bulbs. What a blaze of Caladiums! They're fiery enough to create summer all by themselves! I love what you have created in your garden, Meems. Pity about the few bulbs which seem to be sacrificial victims but a show! 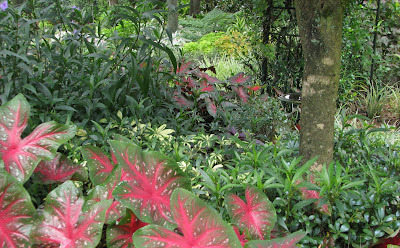 Never considered staggering the planting of Caladiums..Thanks for the tip! Your gardens are always a delight to see. I am always amazed at your selections of caladiums. I love the polka dotted ones. Here I have to get them already started in greenhouses or they don't develop well. I think our growing season isn't long enough for them to get big and pretty. I put caladiums in the window box every year because they don't mind the shade. "Then again I'm a big fan of foliage over flowers." - Aaahh....might be a little New England in ya! Checked out your other blog, and although I'm not a big fan of the beauty of Florida........you might of chipped a little hardness off me with your pics & stories. Caladiums were one of the first plants I fell in love with as a brand new southern gardener after purchasing my first new home. I've tried them here in Indiana but it just isn't the same. I'll just have to enjoy them in your beautiful garden! I know how time consuming it is to plant bulbs. I can't imagine doing a bunch of small bulbs. You can see the work pays off in the end though. OK, I admit it. I'm green with envy. Meems, your garden is so colourful - you don't need any flowers! Excellent idea with placing foundation plants close to hold them up. I'm a huge aroid fan as is and caladiums put on a color show that can't be beat in the summer. Great post. Thanks. I love your Caladiums. Wish I could grow them here. They don't like COOL or COLD temps--as you know. 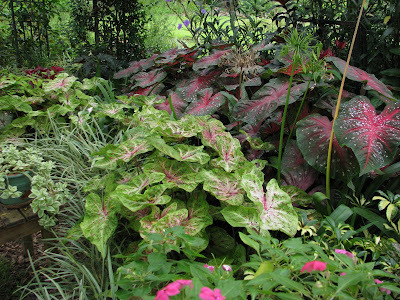 I'll stick to Hostas--but the Caladiums are much more colorful. Thanks for sharing yours. LOVE them. Your gardens are gorgeous as usual. I planted a couple new ones last yr & was surprised to see them appear again this yr. as they were more tropical than my others. I have a lot of what you have. Very pretty leaves. I am so confused about why they don't grown there... do you think it is the cool nights? It's not hard to tell you and I think alike on this... they DO create summer all by themselves... at least for me. Thank you. I do think they like the long, hot summer. When I looked back at photos just from last month it was noticeable they have gotten taller and fuller even this late in the season. I was kind of surprised to see it. I wonder if you tried them in containers if they would be more successful. Especially in a sunny location where the soil gets warmer??? Just a thought. You are right about the time and the pay-off! I think it's worth it, too. You are kind to say that... I do LOVE flowers, too, it's just that foliage works so well here and it is a fun challenge to make it all work together. I suppose there are some places that they just won't cooperate. Thank you for stopping by to see them growing here. YOu have so many other beautiful things in your garden! Tightly planting works well especially at the end of the season when they tend to start falling over just before they fade completely. Ohhhhh... everytime I see pretty hostas I SO wish they would grow here. The leaves are stunning on them. THEY don't like the heat of central Florida. Happy to hear yours returned for you. They are pretty good to keep coming back year after year if left unturned. Meems, I live in Central Florida on the left coast, can you plant the caladiums any time? Your gardens are absolutely beautiful. Thank you for sharing your hard work and dedication. i know you are still experiencing summer in a big way...the good part is that it is good for all your caladiums. i am always amazed at how many you order and cram into every space and it looks effortless. we all know that is not true. what a great find for you all those years ago...with your first caladiums. Every year I've experimented with stretching the planting date later into summer. What I've noticed is that as long as the soil is warm you can plant them. But I would say to give them (and you) the most benefit for enjoying their full potential I'd be sure to plant the last of them by the end of August. Our days are already shortening. It will be interesting to see how long the ones I planted in July last. Still I recommend getting the majoritey of them in the ground by June 1 or mid-June in order for them to brighten up the summer garden. They won't disappoint. (You know it was my sweet next door neighbor who got me started with caladiums and ordering online -bless her). Have a great holiday weekend, and hugs to fam. That's majority- not majoritey... fingers flying. Your garden is stellar. I love caladiums, and you have definitely spiked my interest to add more to my garden next spring. Thanks for sharing your beautiful gardens. Have a great Labor Day weekend. Thank you for visiting Hoe & Shovel. 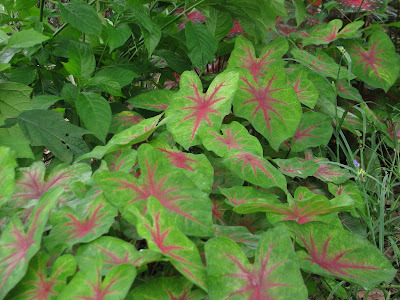 I hope you will plant more caladiums next spring if you like them. You won't be disappointed. They are just too easy not to give them a try. Have a great labor day, too. 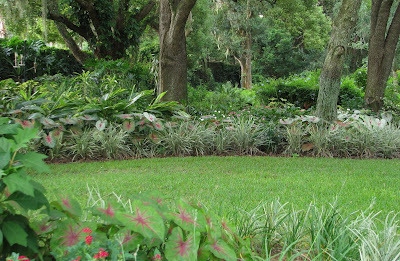 I loved your article in the Tampa Tribune, I read it before visiting the Caladium Festival in Lake Placid. You inspired me to buy two differing types of caladium, I hope to transplant them to containers soon as do not have enough shade in the garden for them yet! 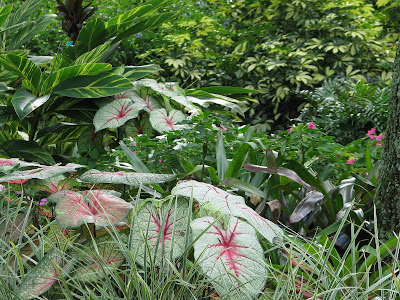 Do you de-eye your caladium prior to planting (the varieties that benefit)? Also, I noticed that you did not dead-head your agapanthus (Lily of the Nile). Do you collect the seed? Or is there a benefit to leaving the flowers to dry on the plant? Almost every one of my container plants gets a few caladiums popped into the soil to add those leafy wonders for summer time pop. Thank you for your kind words ... always nice to know when inspiration is nurtured. I do not de-eye my caladiums. Probably because I plant too many each year and it would just be too much effort. It is something I'm considering experimenting with on a small scale though and logging results... just to see if it makes a big difference. Will keep the blog posted if I do next year. I used to dead-head my agapanthus right away until I learned it makes no difference in the plant. The fading blooms are left now for vertical interest as it fades to seed heads. We don't get too many opportunities this far south for season change... the agapanthus waning bloom is my faux-autumn fun. Once the heads have dried completely I do shake the seeds onto the ground as I prune them. I can't tell you if I've had any results. Perhaps this year I'll save some out and plant them in a container to see if they produce. That sounds like a plan. Thank you for visiting and spurring my thoughts on these ideas.